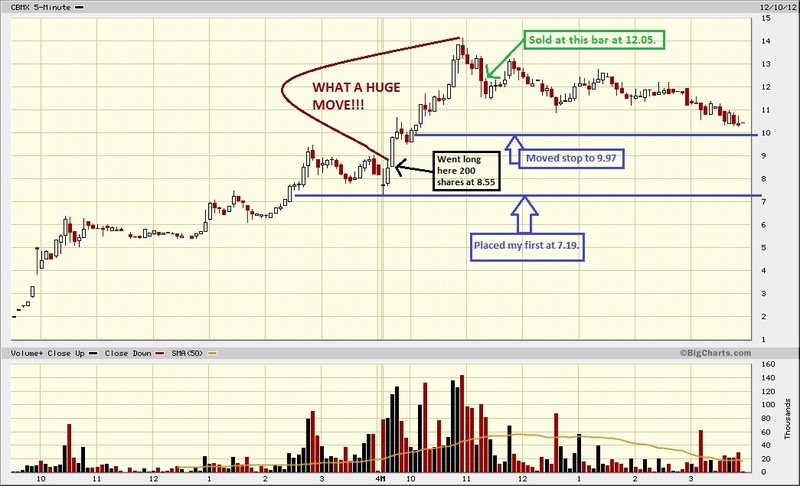 TRADER 9: Trade of the day, CBMX!!! Usually my trade of the day is a bounce play I profited on, but ZGNX didn't work out for me today. CBMX was a perfect continuation breakout play that I caught perfectly today. I only got 200 shares of this stock at 8.55 a share because I've went into a few breakout plays recently and gotten stop-out quick. All I could say is, "I wish I bought my usual 1000 share lot!". Oh well, $700 is not bad for about 2 hours of work. Anyways, I ended up selling at 12.05 a share when I thought it move up way too much and started to sell-off a bit. It was a pretty nice 3.5 point gain, but again, "I wish I bought my usual 1000 share lot! ".